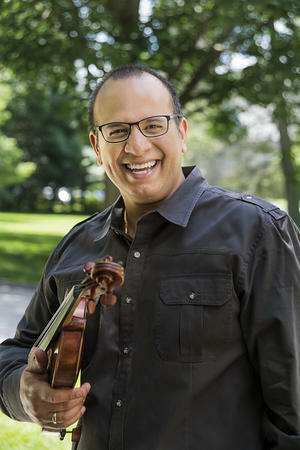 Violinist Carlos Rubio began his musical career as a member of Venezuela's famous Youth Orchestra System ("El Sistema"). As a member of the Simón Bolívar Symphony Orchestra, he toured France, Japan, USA, Mexico, Spain and participated in seven CD recordings under the Dorian Records label. Mr. Rubio has taught master classes and performed at Miami University, Wilfrid Laurier University in Canada, University of Wisconsin Eau Claire, University of Tennessee, Drake University, University of Iowa, University of Nebraska at Omaha, Festival de Música Latinoamericana in Colombia, Festival y Academia del Nuevo Mundo, the Simon Bolivar Conservatory of Music in Venezuela, Colorado State University, and is a founding member of the Dalí Quartet International Music Festival. Mr. Rubio was awarded grand prize in the Spanish and Latin American Music Competition at Indiana University Jacobs School of Music and was distinguished as the Ohio Latino Arts Association's Performing Artist of the Year. Mr. Rubio has soloed with the Middletown Symphony, the Illinois Philharmonic, and the Oxford Chamber Orchestra. His chamber music partners have included the Colorado, Oxford, Penderecki, DaPonte, and Amernet string quartets, clarinetist Ricardo Morales, pianists Alessio Bax, Olga Kern, Vanessa Perez, Pamela Mia Paul, and cellist Marc Johnson of the Vermeer Quartet. Additionally, he has collaborated with such composers as Joan Tower, Joel Puckett, Edward Thomas, Susan Botti, Ricardo Lorenz, Efrain Amaya, and Manena Contreras. He has also premièred works by composers Roland Vasquez, Paul Salerni, Terry Vosbein, Diana Arismendi, and Arcangel Castillo-Olivari. Carlos is a founding member of the Dalí Quartet and is on faculty at West Chester University as part of the quartet's residency. He is also the Principal Second Violinist of the Black Pearl Chamber Orchestra, and performs with the Philly Pops, the Harrisburg Symphony, and the IRIS Orchestra. Carlos lives near Philadelphia with his wife Julia and sons Javier and Miguel.